If you throw a stick anywhere in the dry tropics, chances are it will hit a member of the Legume Family. Chances are the stick is from a legume, too. The Legume Family is by far the most important family in dry tropical habitats both in terms of species diversity and number of individuals. 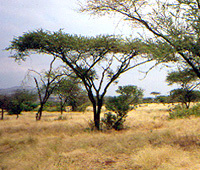 Mimusoid legumes (subfamily Mimusoideae): Acacia trees in the Rift Valley near Lake Magadi in southern Kenya. The family is of enormous economic importance for food, fuel, fodder, and other products such as gums (locust bean gum and guar).